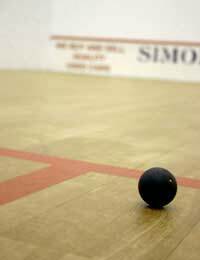 Playing squash or racquetball is a great way to give you an excellent cardio-vascular workout. You get a good upper body workout using the torso and arms to swing the racquet and you also get a great lower body workout by utilising the legs to run around the court. In an hour of squash or racquetball playing, a player can burn between 700-1000 calories, which is a lot more than other sports. To play at a decent level you need to be very fit, strong leg, upper body strength and stamina are required. You also need to have strong wrists. In tennis for instance the powers comes from the shoulders and arms and follow through. In racquetball and squash the shoulders and arms are used too, but the control and drive come from the wrist so it's important if you are taking up racquetball or squash that specific training on the wrists takes place to improve flexibility and strength. Quick reflexes and reaction speeds are needed as squash and racquetball are extremely fast sports. Did you know? It takes less than half a second for a ball travelling at that speed to rebound into court. It has more power than a .22 bullet. Player's shots and racquet swings carry considerable force. Unlike other fast ball games the two players (four in doubles) share the same court space, and collisions between the players and sometimes players and racquets is common. The ability to react quickly to the direction and speed of opponent's shots is a vital skill that needs to be developed. Short anaerobic workouts and sprint intervals that concentrate on footwork will benefit anyone who plays racquet sports. Short sprints of 10-20yds with a short rest interval (20-30 seconds) between sprints help develop fast foot movement. Another good exercise to improve foot movement is sprinting even shorter distances and changing direction and stopping quickly. Having the ability to stop quickly and change direction while maintaining your balance will improve your game. Many newcomers to squash or racquetball are surprised by the amount of endurance that's required to chase the ball down during a game. Although the court is relatively small, the game is played at high speed and players are moving more frequently than in a lot of other sports. Endurance can be built up by sprinting 20-30yds and back, then walk on the spot for 15 seconds then repeat the drill. The wrists are part of the body that are normally neglected in weight training, but it's important in squash training that the wrists are targeted. Strengthening of the wrists can be aided by the use of dumbbells. Get yourself into a comfortable seated position and take a pair of light dumbbells, one in each hand, and rest the arm on the knee with the dumbbell and wrist dangling just off the knee. With your palms face down, curl and flex the wrists so the knuckles move up and point in the direction of your face. Repeat 10 times. Rubber tubing to help strengthen the wrists is available from most sports stores. Look for the packs with instruction leaflets that contain exercises. Tennis elbow is common in all racquet sports and squash and racquetball are no different. To try and reduce the risk of this and other repetitive injuries, remember that relaxing the muscles generates more power. Tensing up, or gripping the racquet too tightly and not following through with the shot can lead to the irritation that causes tennis elbow. Any tightening should only take place when contact with the ball is made, and a smooth follow through motion should take place rather than just stopping when a connection ids made between racquet and ball. Eye injuries are quite common in racquetball and squash because of the speed of movement of the ball so eye protection is important. Different kinds of squash glasses are available, so make sure you have a pair before taking up the sport. Body collisions occur during the game, so always be aware of your opponent's position on the court at all times. Finally make sure you have a bottle of water handy during a game. A lot of fluids are lost during a speedy game of squash, so frequent water breaks are necessary.